Giles (650-710), was a Greek hermit from Athens. He founded an abbey in Arles under Benedictine Rule which became a place of pilgrimage and a stop-off on the Pilgrim Way of St James on the journey to Santiago de Compostela. He is one of the Fourteen Holy Helpers, a 14th century group whose intercession is believed to be particularly effective, especially against various diseases. 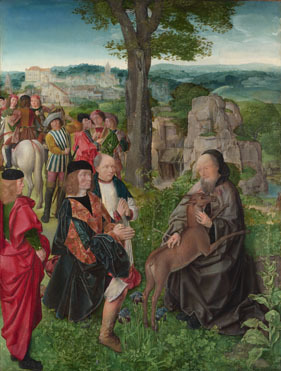 In his early life he lived deep in the forests, his sole companion being a deer who sustained him on her milk.The king's hunters, chasing the deer, shot an arrow at the deer but wounded Giles, who later became known as patron of cripples.